Debates about methods of supporting language development and academic skills of deaf or hard-of-hearing children have waxed and waned for more than 100 years: Will using sign language interfere with learning to use spoken language or does it offer optimal access to communication for deaf children?... read more Does placement in classrooms with mostly hearing children enhance or impede academic and social-emotional development? Will cochlear implants or other assistive listening devices provide deaf children with sufficient input for age-appropriate reading abilities? Are traditional methods of classroom teaching effective for deaf and hard-of-hearing students? Although there is a wealth of evidence with regard to each of these issues, too often, decisions on how to best support deaf and hard-of-hearing children in developing language and academic skills are made based on incorrect or incomplete information. No matter how well-intentioned, decisions grounded in opinions, beliefs, or value judgments are insufficient to guide practice. Instead, we need to take advantage of relevant, emerging research concerning best practices and outcomes in educating deaf and hard-of-hearing learners. In this critical evaluation of what we know and what we do not know about educating deaf and hard-of-hearing students, the authors examine a wide range of educational settings and research methods that have guided deaf education in recent years--or should. The book provides a focus for future educational and research efforts, and aims to promote optimal support for deaf and hard-of-hearing learners of all ages. Co-authored by two of the most respected leaders in the field, this book summarizes and evaluates research findings across multiple disciplines pertaining to the raising and educating of deaf children, providing a comprehensive but concise record of the successes, failures, and unanswered questions in deaf education. 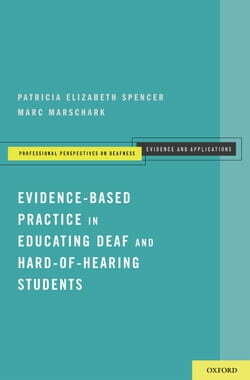 A readily accessible and invaluable source for teachers, university students, and other professionals, Evidence-Based Practice in Educating Deaf and Hard-of-Hearing Students encourages readers to reconsider assumptions and delve more deeply into what we really know about deaf and hard-of-hearing children, their patterns of development, and their lifelong learning.